These PowerPoint shortcuts work in slideshow mode (when you are presenting your PPT in full screen). Go directly to a particular slide: Type the slide number and press enter. If you want to go to Slide 5 directly, type 5 and press enter. This works when you know the slide number. But most of the times you will not remember the slide number. Hence use the next tip. Go directly to a slide (when you don't remember the slide number): Right click on the slide and choose 'Go to Slide'. You can now choose the slide you want to go to from the list. You can view the headers of each slide here. Go directly to the last slide: Press 'End' on the keyboard. Go directly to the first slide: Press 'Home' on the keyboard. In slideshow mode, press the number of slide you want to go and press Enter. It works in MS PowerPoint 2010. 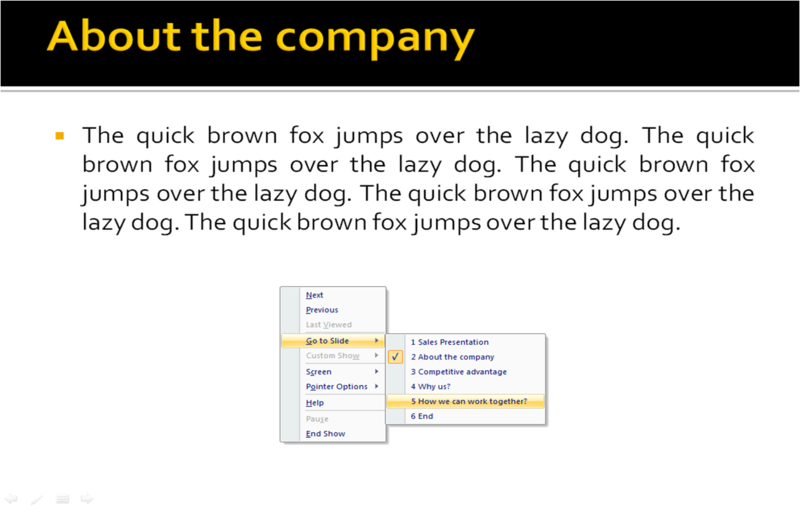 You can have a look here http://nutsandboltsspeedtraining.com/powerpoint-keyboard-shortcuts/ to know more about the PowerPoint shortcuts.